This month will start on September 26, 2015 - because that is when I left for my honeymoon so it is where I ended my last post! 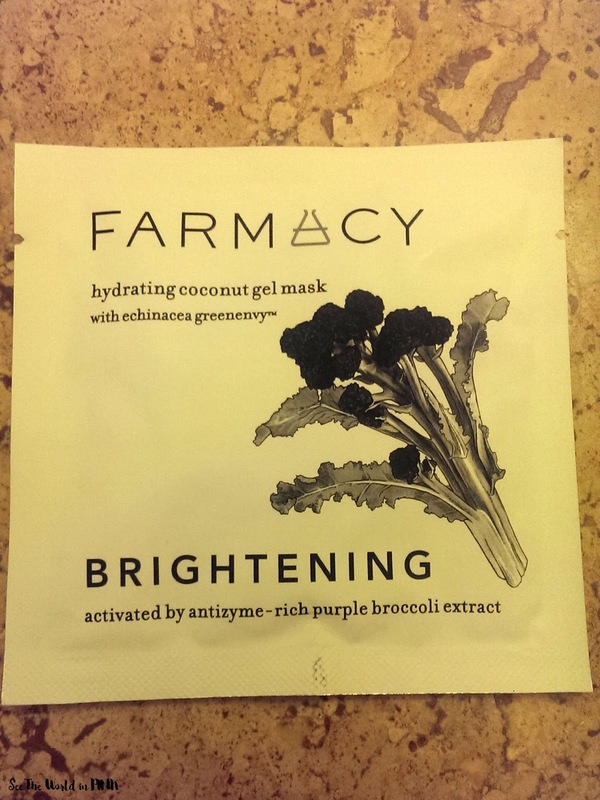 Farmacy Hydrating Coconut Gel Mask - Brightening (Purple Broccoli) ~ $10. A supercharged brightening solution for dark spots and freckles. I can't begin to explain how awesome this mask is!! This is my first time using a Farmacy product! This is a very thin gel mask and it fits so amazing on my skin, it felt like a second skin! It had a milky type essence and felt amazing!!! This may be my new favorite mask - it is so worth the splurge! I bought these with some Ipsy points and I have used them in the past and I reviewed them on a past Month in Masks post here. These are a little big for eye masks and they cover quite a bit of my cheeks, but they adhered well and I liked them! I would use them again! 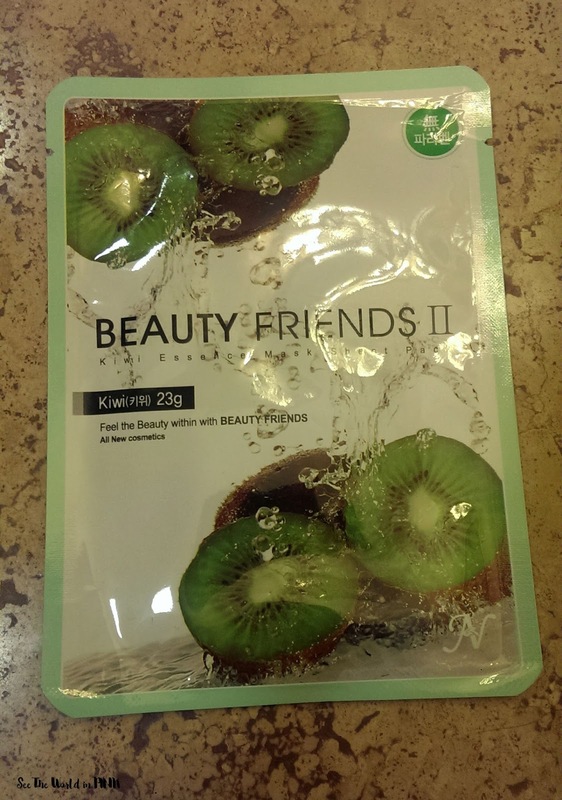 Beauty Friends II Essence Mask Sheet Pack (Kiwi) ~ $1.20. Kiwi - includes Actinidia Chinensis (Kiwi) Fruit Extract containing lots of vitamin C that help to soothe rough and damaged skin which can make skin looking smooth and soft while it cleans and moisturizes. The kiwi face masks have both tonic and therapeutic effects. With its high concentrations of vitamins and organic acids, the kiwi mask is ideal for making your skin smooth, soft, young and more elastic. A great moisturizer with the powers of anti aging. This mask smelled really weird on and it fit really big on! It was nice and cooling on the skin and did make my skin feel good, but I would not repurchase because it was too big! If you have read any of past posts, I love these Innisfree masks! I have previously reviewed this mask right here. The material of these masks is my favorite!! It is so good and feels amazing on! 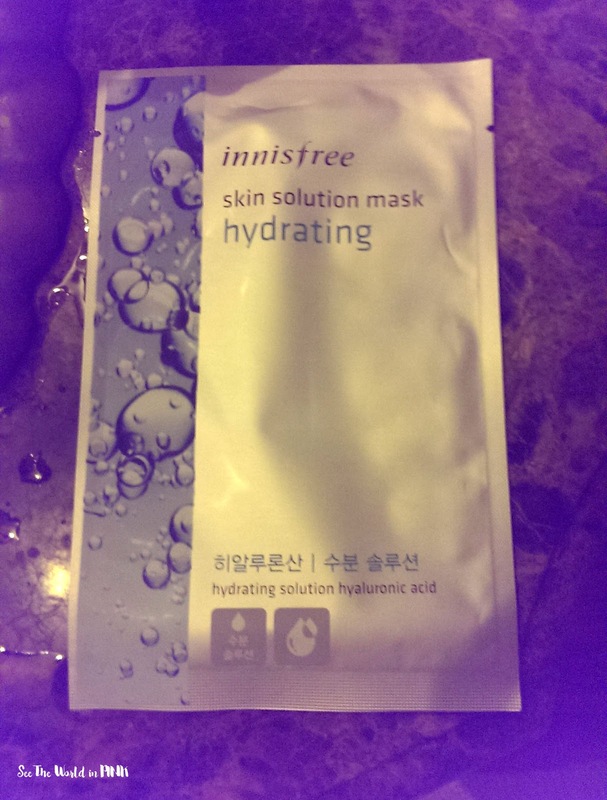 I love this mask and these are some of my favorite inexpensive sheets masks and it is best to buy them when Innisfree has a buy 10 get 10 deal! Fruits and Passions Hydro Gel Face Mask - Vitamin B Soothing ~ $3. This refreshing Hydro Gel Face Mask with a vitamin B derivative and star fruit extract contains an essence specially formulated to improve the appearance of your skin. Your skin is hydrated, soothed and refreshed. I really like hydrogel masks, I know they aren't everyone's favorite but I love how cooling they are on the skin! I had a particularly long day out in the sun before I used this and it felt amazing! I would repurchase these for sure, they made my skin feel great! 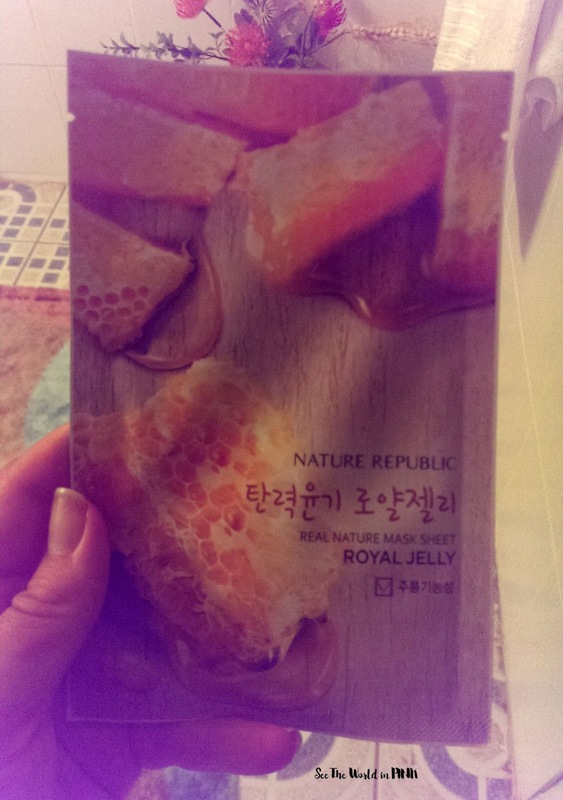 Nature Republic Royal Jelly Mask Sheet ~ $1.99. Increases skin absorption potential. Hydrates with nutrients and moisturize with natural ingredient essences. Ugh, this mask was sooo thin that it pretty much tore in half as I was trying to get it out of the package. That made it even harder to put on. Once it was on my skin it felt nice but I would not repurchase based on the fact that I can hardly get them out of the package without wrecking them! I featured this on a Wine and Mask Wednesday post - you can see the full review here. This mask did not have as much as essence as I was expecting but still made my skin feel really great! I liked that it had a piece for my neck as well. I would buy these masks again! 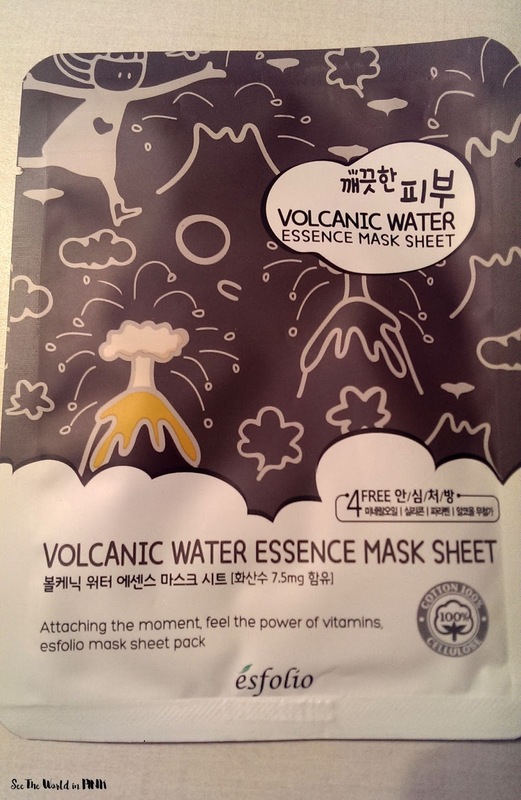 Esfolio Volcanic Water Essence Mask Sheet ~ $0.90. Scoria water is an inorganic substance which is effective in removing keratin and skin wastes. Vitamins of chaenomeles sinensis fruit extract and portulaca oleracea extract help increase skin elasticity and moisture. 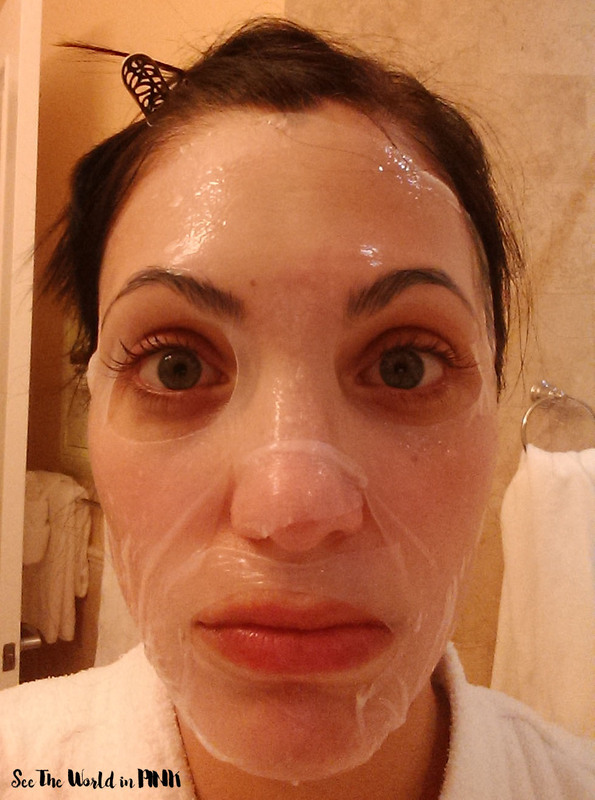 I like the "volcanic" masks - they feel deep cleaning and clear up my skin! The fit on this one was actually pretty good, and I really like how it made my skin feel. I would likely repurchase this mask. 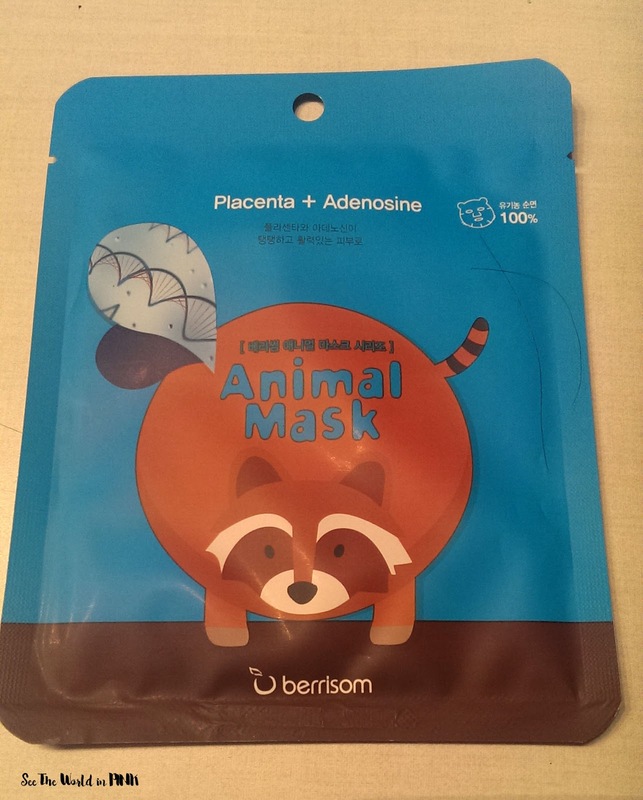 Berrisom Animal Mask "Racoon" ~ $3.41 (set of 7 for $23.88). Anti-Wrinkles (Placenta + Adenosine). How stinkin cute is this mask?! I have ears!!! And, I'm a raccoon!! This was quite full of essence and had a little extra essence in the package. 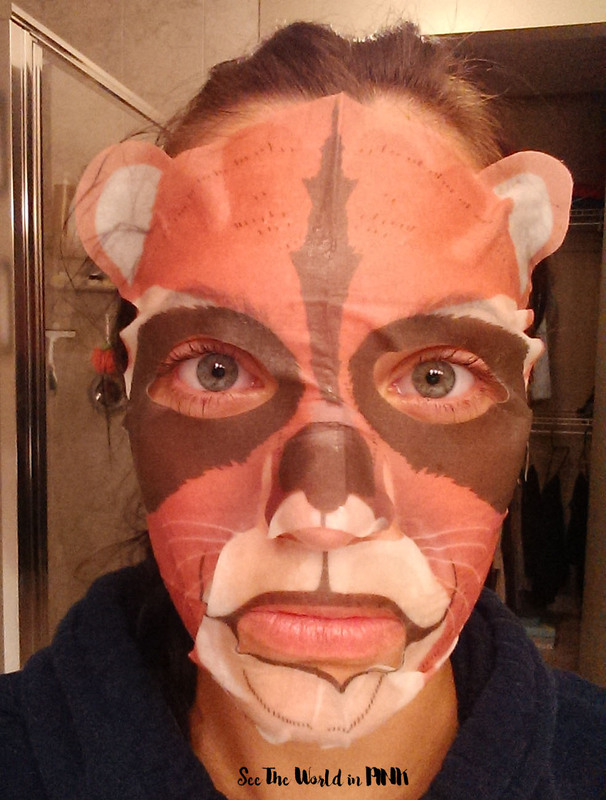 The mask fit my face well and absorbed well in to my skin! I would definitely repurchase this mask! The Face Shop Real Nature Blueberry Mask Sheet ~ $2.00. The Blueberry Real Nature Face Mask leaves skin soft and toned. 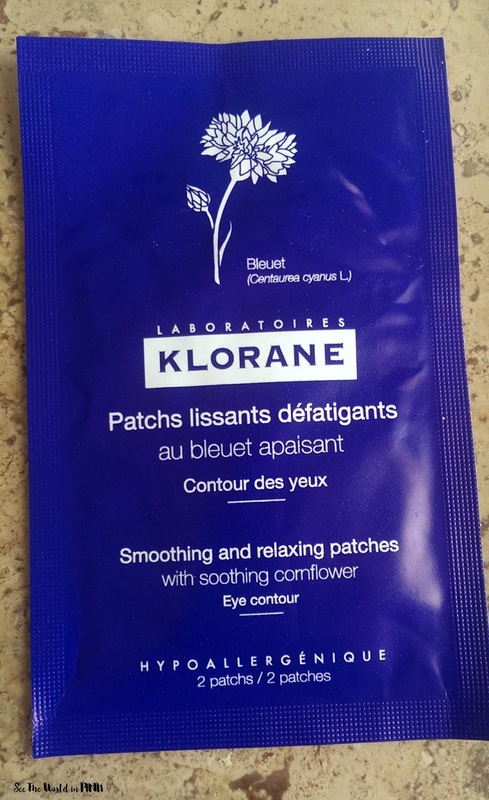 Soothing blueberry extract helps restore skin's suppleness and vitality. I like the Face Shop masks and they are usually my go-to inexpensive masks. This one was featured on a Wine and Mask Wednesday here. This mask fit a little big but I was able to fold it enough that it still worked well on my skin - it made my skin feel soft and I was happy with it! I would repurchase this. Mizon King to the Kong No. 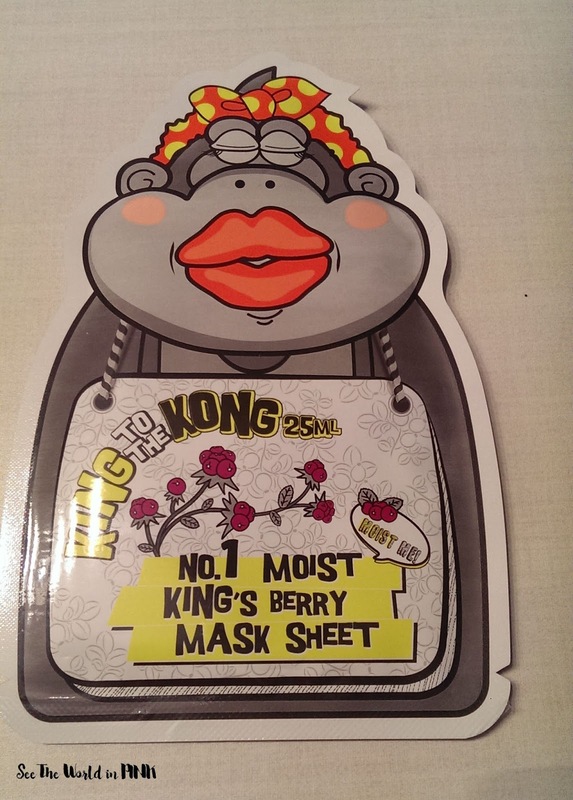 1 Moist King's Berry Mask Sheet ~ $2.92 (5 for $14.59 on Amazon). From Mizon's fun King To The Kong collection, No.1 Moist King's Berry Mask Sheet is a rich hard-to-find moisturizing facial mask brightens skin for a hydrated glow. I reviewed this mask for a Wine and Mask Wednesday all the way back in March - you can see it here. This mask fit super big on my face and wasn't spectacular. It was a little dry and did not have a lot of essence. It was blah to me, I don't think I would repurchase this. I really liked this mask! It smelled really great and did great at exfoliating! I featured this on a Skincare Sunday - you can view the full review here. I was very happy with this and would use this again!! To Go Spa Green Tea Eyes ~ $4.17 for 1 set ($12.50 for 3 sets). Super Anti-oxidant Green Tea contains a potent batch of antioxidants (catechins) to combat dark circles and add an extra brightening supercharge! It’s been called a “Tingly Delight” and the scent will calm and soothe the crankiest of moods! And as always… No Parabens, No Dyes. 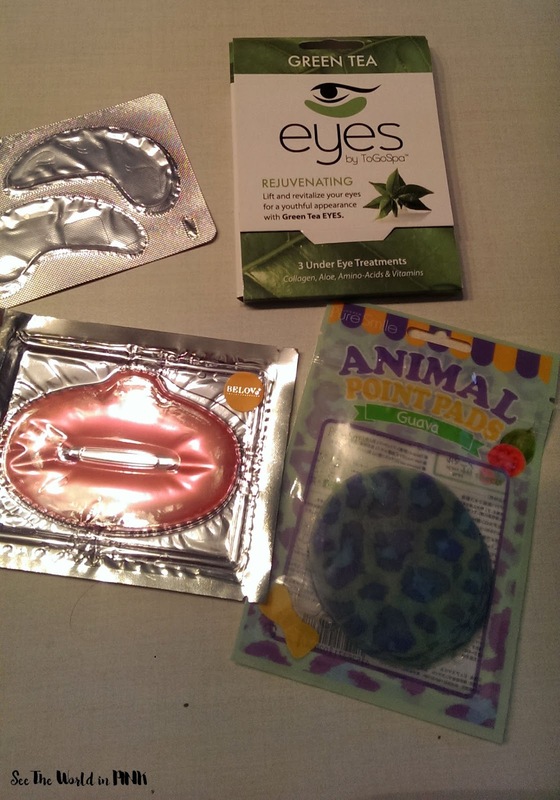 I love To Go Spa eye masks - I was exhausted them morning and really needed a quick fix - these were awesome! They delivered on getting rid of dark circles and making my skin appear brighter! I love the gel-y feel and the fact that these adhere well - I will repurchase these when I am done with the sets I have! BELOV Collagen Lip Mask ~ $5.00 (pack of 3 for $15.00). For those who have dry lips, black lips, mouth, flaky skin to help repair dry lips, lip skin cells to help restore the moisture back. By adding collagen to the lips against UV light. I received this in a Mask Genie Mask Pouch and I have never used a lip mask before so I didn't really know what to expect. This didn't adhere to my lips very well so it was hard to keep on - this did feel cool on and I thought it made my lips feel softer. I'm not sure I would purchase this again just because I think I like using lip scrubs instead. I used a couple of these on my cheeks because they were dry and they worked well. I am not done this package so I will make a final decision about how I feel at the end of the pack, but for now I am happy to use the rest of these! 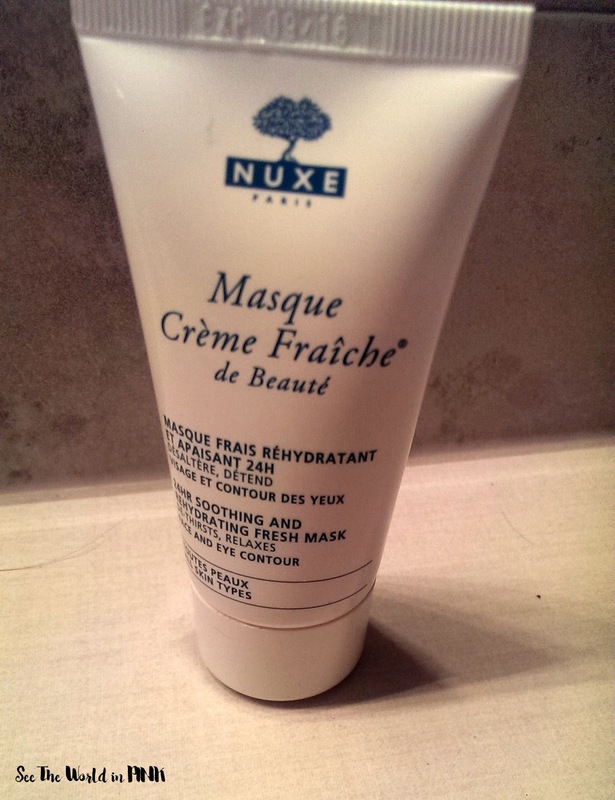 Nuxe Masque Crème Fraîche de Beauté ~ $29. A source of well-being and immediate freshness, this moisturizing mask with Plant Milks and White Blossom provides intensive moisturization even for the driest of skins. A rescue skincare, it provides intensive relief, instantly soothing skin discomfort. Hydrates and soothes for 24 hours, leaving skin radiant. I got this in an old Glossybox and have featured it on an old Wine and Mask Wednesday - you can see the whole review here. This mask can be a leave on or wipe off type - I decided this time to leave it on and it was so moisturizing! I really like this mask! 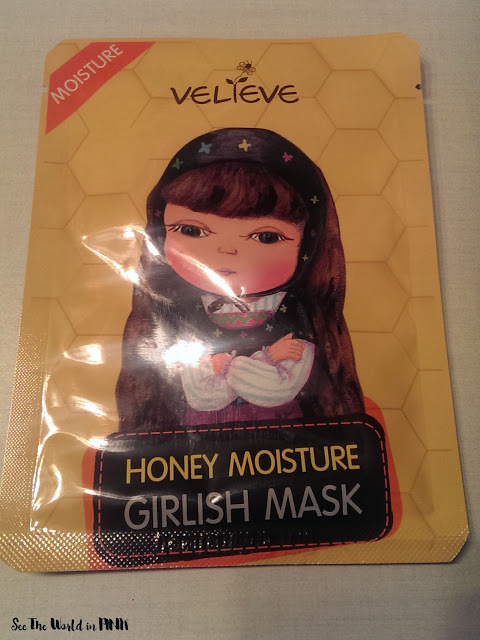 Velieve Girlish Mask ~ $2.50. The mask contains honey and royal jelly extracts which provides moisture and brighteness to your face. It helps to relieve and soften your skin. I received this mask in a Memebox back in the day when they still shipped to Canada - I just featured this on a Wine and Mask Wednesday here. I love the Velieve packing because it is so cute! I loved how moisturizing this honey mask was and I would repurchase this! Farmacy Hydrating Coconut Gel Mask - Soothing (Kale) ~ $10 per mask (pack of 3 for $30). A supercharged boosting solution for stressed, tired skin. I needed this after a busy Halloween and again this mask is absolutely amazing!! Feels so good on and the material is amazing! Made my skin feel great and I can't believe I am encouraging a $10 per mask, but I need more of these and would highly recommend them!!! For October, I did not get to use as many masks as I would have liked - there was actually a stretch of 6 days where I didn't where I didn't even wear a mask! Isn't that crazy! Ugh, I know that is just not the best for my skin! I will certainly do better in November - getting home from the honeymoon and husband's surgery made it hard to take enough time for myself in October!